Rebecca Estelle had to eat too many pumpkins when she was growing up because her family was very poor. Now, as an adult, she hates pumpkins and never wants to see a pumpkin ever again. Then one day, when a truck overloaded with pumpkins drives by her house and drops a pumpkin in her yard (the illustration shown above), Estelle is beside herself. She determines that she won't touch it, won't even look at it. She'll just cover it with dirt and never think about it again. Imagine her surprise the next fall when her yard is full with pumpkins! What will she do? This is a fun book to read during the autumn and is also helpful when teaching about plants and seeds to young children. And, of course, it makes for a great Halloween book. Below is a spread from inside the book, shown here to give you an idea of the illustration style and a rough idea of the amount of text per spread. This spread takes place immediately after Rebecca Estelle sees a pumpkin fall out of a truck and into her yard. Since she hates pumpkins, she says: 'Well, I won't touch it," Rebecca Estelle insisted, getting her shovel from the barn. / "And I won't look at it," she added as she shoveled dirt on top of the pumpkin pieces. / "I won't think about that pumpkin ever again," she declared. And she didn't, until..."
Each child gets their own little booklet to fill out about what they discover about their own pumpkin. We found this activity on teacher Cara Carroll's teaching blog, The First Grade Parade. 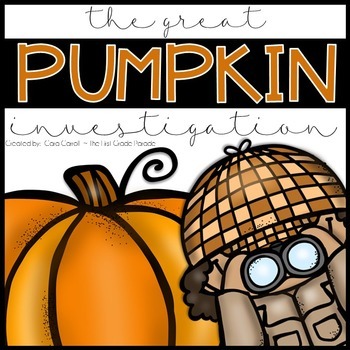 You can find the write up and print out here: pumpkin-themed classroom activity We do the activity essentially the way she describes, except we don't cut into the pumpkins like she does (because we promise parents that the pumpkin will get sent back home in tact). (We definitely recommend you buy the $3 Teachers-Pay-Teachers packet that she is selling! It's the booklet mentioned above, and it helps provide structure to the activity). 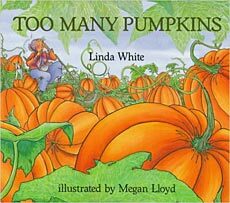 If you are looking for a book about pumpkins, there's TON of them! Makes sense... kids love all things Halloween, including pumpkins! 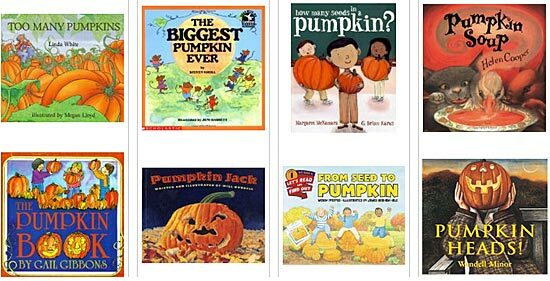 To see more pumpkin books at Amazon, click the images below or click here.